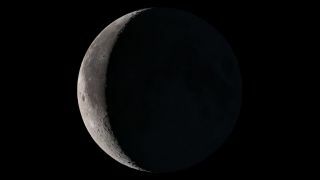 This image shows the moon as its shadow wanes, leading up to a new moon. The "black moon"
As one who has been involved in the broadcasting field for nearly 40 years, I'd like to point out that we live in a time when the news media is seemingly obsessed with "branding." This marketing strategy involves creating a differentiated name and image — often using a tagline — in order to establish a presence in people's mind. In recent years in the field of astronomy, for example, we've seen annular eclipses — those cases when the moon is too small to completely cover the disk of the sun — become branded as "Ring of Fire Eclipses." A total eclipse of the moon — when the moon's plunge through the Earth's shadow causes the satellite to turn a coppery red color — is now referred to as a "Blood Moon." When a full moon is also passing through that part of its orbit that brings it closest to Earth — perigee — we now brand that circumstance as a supermoon. That term was actually conjured up by an astrologer back in 1979 but quite suddenly became a very popular media brand after an exceptionally close approach of a full moon to Earth in March 2011. It surprises me that even NASA now endorses the term, although it seems to me the astronomical community in general shies away from designating any perigee full moon as "super." Then there is Blue Moon. This moniker came about because a writer for Sky & Telescope Magazine misinterpreted an arcane definition given by a now-defunct New England Almanac for when a full moon is branded "blue," and instead incorrectly reasoned that in a month with two full moons, the second is called a Blue Moon. That was a brand that quietly went unnoticed for some 40 years, until a syndicated radio show promoted the term in the 1980s and it then went viral. So now, even though the second full moon in a month is not the original definition for a Blue Moon, in popular culture we now automatically associate the second full moon in a calendar month with a Blue Moon. So are you ready for yet another lunar brand? The newest one is Black Moon.